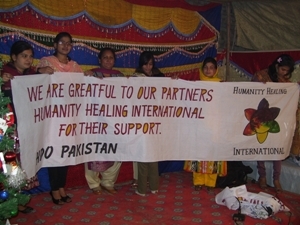 Humanity Healing International has partnered with Hope Development Organization, a women-run NGO struggling for Human Rights in Pakistan. It was founded in 1997 by a Feminist group and equal human rights believers as a result of the horrible crimes against women occurring in the country. Their mission is to educate children in the ways of peace and empowering our women as equal citizens. Working together with Hope Development Organization, we can transform disadvantaged women and girls through sustainable development, with emphasis on physical, social and economic help through medicine, encouragement, human rights awareness and skill training. Current projects include Vocational Training and Women’s Advocacy Training.